Are there any good methods / tools / templates for evaluating the consistency of multiple websites from one product family in terms of UI components, patterns, button placements, labelling, date formats, UK vs US spelling and its consistent use across products, etc, etc. I'm wondering if there any smart way of conducting this? Essentially what you want to do is called a 'heuristic evaluation' or 'expert review' - reviewing the sites with a number of different mindsets, or 'hats'. It's for you to decide in any given site comparison study what it is that is important to you, your business, your client, etc - i.e. which hats you want to wear. He even provides an excel workbook with all the guidelines, boxes to enter the conformance status, with a result page. You can ignore some guidelines if not relevant. 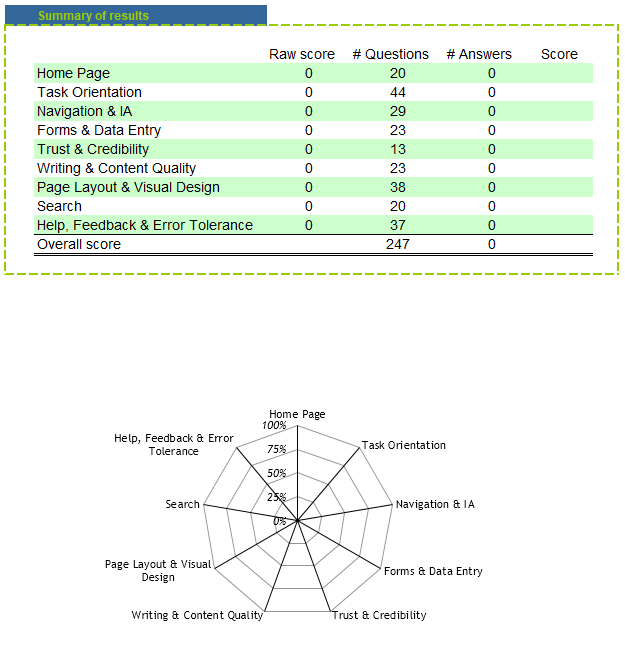 The result page summarises with a table and a radar chart identifying which categories the site does well, or poorly in. It's probably not beyond the wit of man to extend this framework to further include criteria that you may be interested in. Note that this does not provide an absolute guideline compliance statistic. Each question has a context, and each person reviewing may have different ideas of what compliance looks like. However, if the same person does the site comparison then you can compare the relative results of each category of each site. You might get different people to carry out the same expert reviews and compare notes, but don't expect to be able to get good results when comparing your results of one site with someone else's results from another site! Not the answer you're looking for? Browse other questions tagged website-design gui-design consistency methodology evaluation or ask your own question. What is best practice for consistency across different products? Is it appropriate to discussed the proposed usability method in literature review or in methodology chapter?